The rest of “The Sea: A Cultural History,” tries to divorce itself from this mindset by showing how us humans have interacted with the sea over time, and largely succeeds in doing so. He gives us the art it has inspired, the requisite Melville and Defoe references and whatnot, and also windows into the peculiarities and intricacies of maritime life. But what sets this entry into the vast library of pelagic literature apart is the attention given to non-Western cultures—the ones typically skipped over in favor of the Magellans and Columbi. Mack is a professor of world art studies at the University of East Anglia across the pond from us, and specializes in African art. He has published widely on the subject, earning his chops through extensive travels and a keen anthropological eye. This pays off when Mack describes, in one of the book’s most fascinating passages, the commonly held belief in “exotic spirits arriving from the seas”—a concept held through the western part of Africa, the Caribbean and parts of Brazil. He discusses the way various cultures have interpreted the idea aesthetically, and manages to tie it in to globalization. Indeed, “The Sea” is as insightful and encyclopedic in scope as they come. 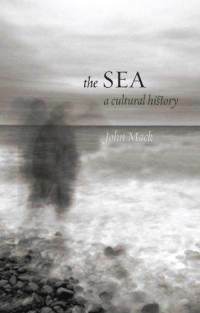 To pen the history of the sea is a formidable undertaking, and Mack approaches it confidently, armed with thorough research. The problem is, the same thorough research and encyclopedic knowledge can evoke the tone of a term paper, the densely academic prose feeling as cold as the Atlantic. So, despite its nautical subject and the fact that it boasts a chapter called “Beaches,” you will not likely find too many sunbathers skimming this at Oak Street Beach as they soak in the final weeks of summer.